Pressure washing is one of the most effective ways to clean your home’s exterior. Thanks to its high-pressure water stream, it can penetrate textured surfaces such as aluminum, wood and vinyl sidings. However, this chore requires some level of skills and enough knowledge to not risk doing more harm than good your home. 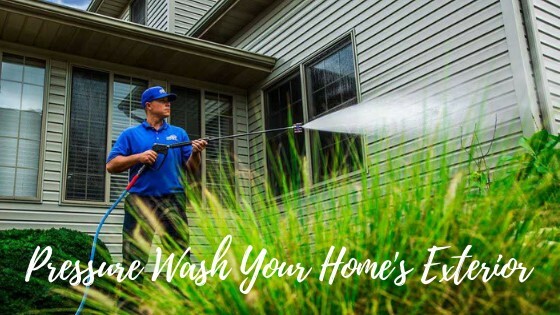 Read on and learn tips that will help you use a pressure washer to clean your home’s exterior safely and effectively. Before we get to the details on how to properly pressure wash your siding, it is important to note that if your house is painted with lead paint, it shouldn’t be cleaned using a pressure washer. This typically applies to houses painted before 1978. If you think your house was painted with a lead-based paint, contact a professional like Mackay at Timberline Home Inspections to conduct an inspection and get a recommendation. Clean the area from any obstacles that may cause a trip hazard or tangle your hose. Secure electrical components by covering them. Include light fixtures. Spray cleaning solution from the bottom and work your way up to prevent streaks. Let the solution work for up to 10 minutes but keep it wet. With a rotating scrub brush attachment, scour heavily soiled areas. Rinse by using a general, medium-pressure pattern then flush any detergent from the system. Working all the way from the top down, thoroughly rinse the detergent residue. To keep water from underneath the siding, work in the same direction as any overlaps. Use a general, high-pressure spray pattern for soffits and gutters. To reduce streaks and spots from dripping wastewater or detergent, use plain water to rinse soffits and gutters. Direct the stream ahead and to the side, as you work to keep water off yourself. With a delicate, low-pressure pattern. soak the surface of the bricks with plain water. This will prevent the absorption of the detergent into the bricks. Apply the detergent from bottom to top. Soak for up to 10 minutes but keep the bricks wet. Apply more detergent but less pressure. For heavily soiled areas, use a rotating scrub brush. With a low-pressure, delicate spray pattern rinse the detergent and residue from top to the bottom. Seal your bricks with a brick and mortar sealer. Ensure you follow the manufacturer’s instructions. Sounds easy and fun? Well, kind of. But if you’re not confident and comfortable handling high-pressure equipment, it would be best to hire a pro like Get Superior Cleaning to get the job done. Contact us today at (205) 427-5296 and let us get your home’s exterior cleaned up!